Intuity® Ject is the only fully automated medical device for reconstitution and administration of lyophilised biological drugs from a vial. This medical device is intended for all biological products, including viscous products, whether in dry or liquid form, for subcutaneous or intramuscular injection. Intuity® Ject offers a unique, safe, and automatic alternative for simple and precise preparation and injection. 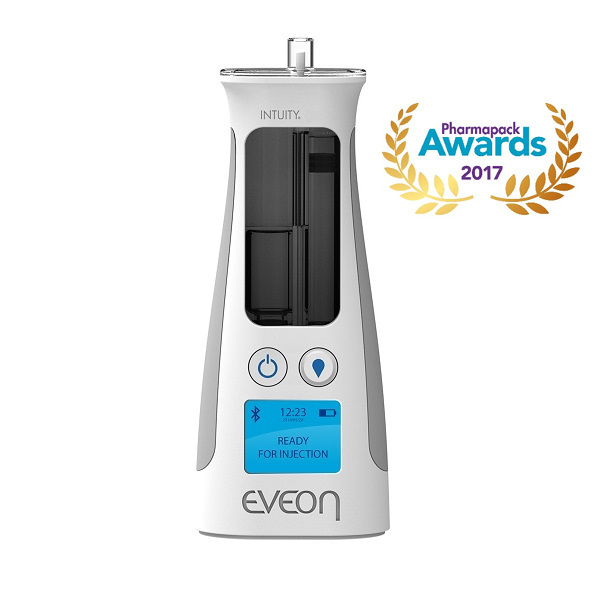 In February 2017, the Intuity® Ject device received the award for best innovation from Pharmapack Europe, with the mention Ease of use and patient compliance. One of our priorities with this device is to meet the current efficiency challenges of the healthcare system: keeping patients at home, safety and ease of use, improvement of treatment adherence, injection precision, and patient connectivity for better monitoring by healthcare professionals. Intuity® Ject is at the heart of developments within the framework of the partnership: an automatic device for reconstitution and injection of a lyophilised drug. Ergonomics, ease of use, and connectivity are all key features in the product’s design. This agreement is the outcome of the JBT HubUp alliance, announced in November 2017, which brings together seven companies, including EVEON, and provides members of the medical and pharmaceutical industry with a unique solution for developing innovative medical devices by gathering together, in the early stages of a project, the professional skills needed to reach all of the goals: including design, manufacturing, assembly, and qualification. “We are proud to work on an extensive subject that is at the heart of our goals: a connected automatic device for reconstitution and injection in the home care setting. For several months, our teams have been mobilised around this technological challenge, working in synergy with the teams of the JBT HubUp alliance in order to meet our client’s requirements”, said Vincent Tempelaere, our CEO. For more information, download the full press release.